Gosnell's (2005) popular treatise on Ice (cf. chapter 1) offers a well-crafted and accessible discussion of some of the peculiarities of water, including the delightful quote from James Trefil. Trefil, J. (1986). Meditations at 10,000 Feet: A Scientist in the Mountains. Charles Scribner's Sons, New York. 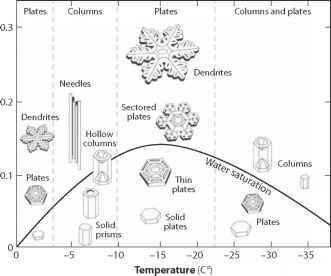 Those seeking a more physics-based discussion of the crystal structure of snowflakes will find reward in Fletcher (1971) and Libbrecht (2005). Libbrecht provides some stunning photographs of synthetic crystals. There is also an extensive and impressive collection of work on scanning electron microscope images of snowflakes based out of the U.S. Department of Agriculture labs in Beltsville, Maryland (e.g., Wergin et al., 1998; Rango et al., 2000). Bill Wergin kindly provided the microphotograph in figure 2.1b. Rango, A., W.P. Wergin, E.F. Erbe, and E.G. Josberger (2000). Snow crystal imaging using scanning electron microscopy. III. Glacier ice, snow and biota. Journal of Hydrological Sciences, 45 (3), 357-375. Wergin, W.P., A. Rango, and E.F. Erbe (1998). Image comparisons of snow and ice crystals photographed by light (video) microscopy and low temperature scanning electron microscopy. Scanning, 20, 285-296. Different values for the thermodynamic properties of snow and ice are found in the research literature, so it is difficult to distill this to single "recommended" values. Consistent with the climate-system emphasis within this text, I emphasize the macroscale (rather than molecular-scale) thermodynamic behavior, and recommended values here are based on recent field-data compilations, where possible. Shea, J.M., F.S. Anslow, and S.J. Marshall (2005). Hydrome-teorological relationships on the Haig Glacier, Alberta, Canada. Annals of Glaciology, 40, 52-60. Sinclair, K.E. and S.J. Marshall (2009). The impact of vapour trajectory on the isotope signal of Canadian Rocky Mountain snowpacks. Journal of Glaciology, 55 (191), 485-498. Values for the density of firn and ice are from Cuffey and Paterson (2010). Herron and Wu (1994) discuss the effects of solar radiation on subsurface melt and the resulting effects on lake ice density during late stages of melt. Cuffey, K.M., and W.S.B. Paterson (2010). The Physics of Glaciers, 4th ed. Butterworth-Heinemann, oxford, UK, 693 pp. Herron, R., and M.K. Woo (1994). Decay of a High Arctic lakeice cover: Observations and modelling. Journal of Glaciol-ogy, 40 (135), 283-292. Bitz, C.M., and W.H. Lipscomb (1999). An energy-conserving thermodynamic model of sea ice. Journal of Geophysical Research, 104, 15669-15677. Pringle, D.J., H. Eicken, H.J. Trodahl, and L.G.E. Backstrom (2007). Thermal conductivity of landfast Antarctic and Arctic sea ice. Journal of Geophysical Research, 112, C04017, doi:10.1029/2006JC003641. Sturm, M., J. Holmgren, M. König, and K. Morris (1997). The thermal conductivity of seasonal snow. Journal of Glaciol-ogy, 43 (143), 26-41. Sturm, M., D.K. Perovich, and J. Holmgren (2002). Thermal conductivity and heat transfer through the snow on the ice of the Beaufort Sea. Journal of Geophysical Research, 107 (C10), 8047, doi:10.1029/2000JC000400. Untersteiner, N. (1961). On the mass and heat budget of Arctic sea ice. Arch. Meteorol. Geophys. Bioklimatol. Ser. A., 12, 151-182. Untersteiner, N. (1964). Calculations of temperature regime and heat budget of sea ice in the Central Arctic. Journal of Geophysical Research, 69, 4755-4766. Allison, I., R.E. Brandt, and S.G. Warren (1993). East Antarctic sea ice: Albedo, thickness distribution, and snow cover. Journal of Geophysical Research, 98 (C7), 12417-12429. Grenfell, T.C., S.G. Warren, and P.C. Muller (1994). Reflection of solar radiation by the Antarctic snow surface at ultraviolet, visible, and near-infrared wavelengths. Journal of Geophysical Research, 99 (D9), 18699-18684. Wiscombe, W.J., and S.G. Warren (1980). A model for the spectral albedo of snow, I: Pure snow. Journal of Atmospheric Science, 37, 2712-2733. Warren, S.G., and W.J. Wiscombe (1980). A model for the spectral albedo of snow, II: Snow containing atmospheric aerosols. Journal of Atmospheric Science, 37, 2734-2745.